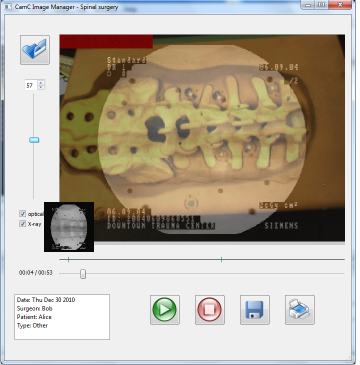 Freehand SPECT is a novel imaging method belonging to nuclear medical imaging category. Contrary to its former kinds, freehand SPECT is not bound to a bulky gantry of sensors, instead benefits from a tracked gamma handheld probe. Although This feature provides tremendous flexibility, poses certain challenges as well. Among them, inapplicability of optimized acquisition and reconstruction techniques could be address. According to its certain specifications, those techniques tailored for freehand SPECT needed to be established. When it comes to verification and validation of SPECT imaging setups even those which benefit from mathematically well defined structure of sensors, due to intrinsic uncertainty in radioactive decay, a computer simulator is of high demand; both due to reliability on results and financial advantages. In freehand SPECT this uncertainty is twofold: that of radioactive decay and acquisition geometry, which strongly demand a tailored computer simulator that addresses certain requirements for flexibility in acquisition geometry and is not the case in available computer simulators. In this work, in order for conducting a wide variety of studies such as scanning protocols for certain clinical cases or comparison of different gamma probes on reconstruction in identical cases, we are developing a computer simulator for scanning in freehand SPECT. This work is under supervision of Prof. Nassir Navab, Dr. Tobias Lasser and Dr. Thomas Wendler and is sponsored by SurgicEye GmbH and chair of computer aided medical procedures in TUM. In this project we develop a tool for visualizing CamC recorded optical view with dynamically adjustable corresponding X-ray overlay. The software is developed in C++, using Qt, OpenGL and OpenCv libraries.